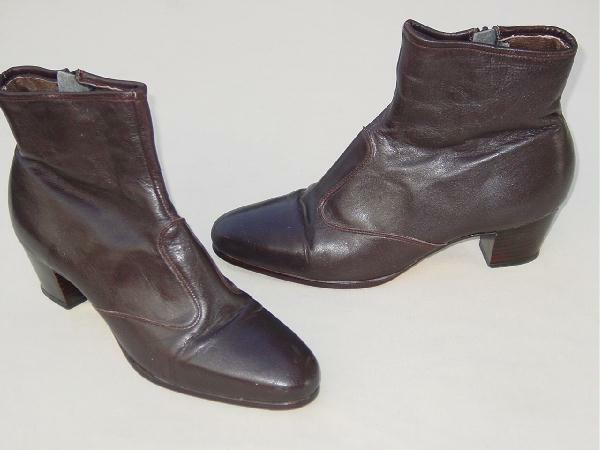 These vintage mod dark brown leather ankle boots have a side zipper and a chunky heel. There is a stitched design that goes up from the side of the vamp to over the instep. They're lined in brown fabric. Wear a dark sock with these boots because the dye from the interior lining transfers. There are scuff marks on the toes, and the left shoe has some scrapes on the toe by the sole. The model who owned them didn't wear them much because she was usually working in warm weather climates, and then moved to Miami.